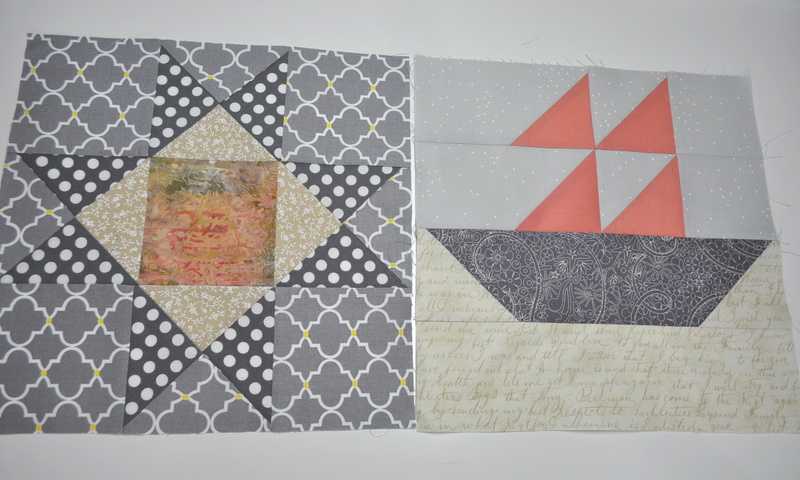 Two more scrappy blocks to show you this month. 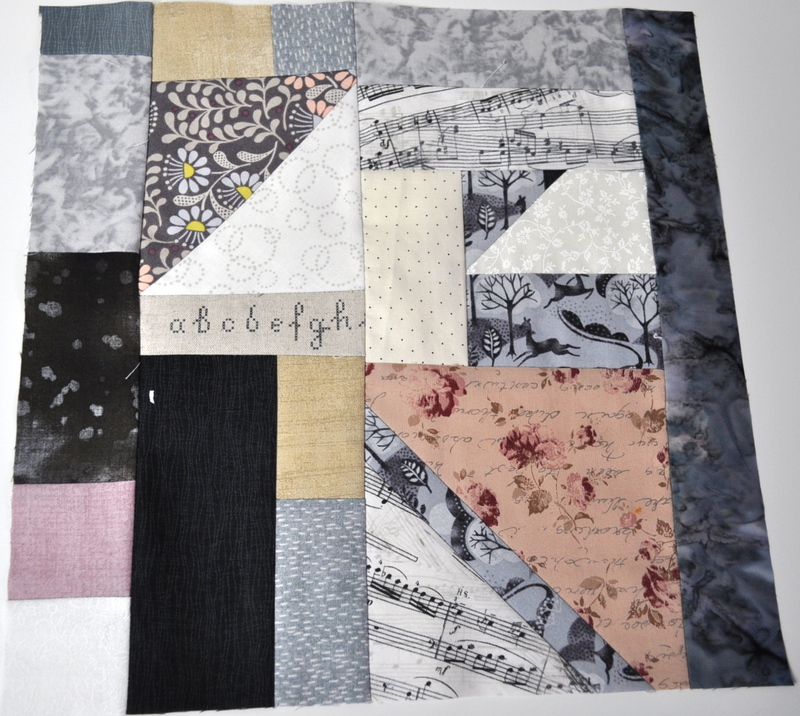 I’ve decided to make them – or at least nine of them – using scraps left over from making the F2F blocks so, each month I’ll make three 12 inch blocks for that month’s participant and, with the scraps, make a block for my eventual scrappy quilt. That’s the plan anyway. 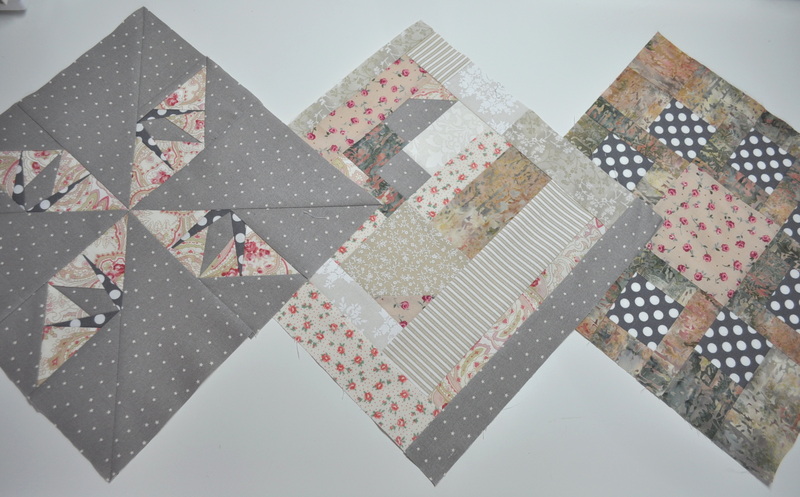 I was ‘Miss June’ and chose neutrals for my F2F colour palette so this is the scrappy block I made after making my own three blocks (well, I’m still part way through the third one but you get my drift). Sue, from Washington, is ‘Miss July’ and her colour choices were different shades of blue with white. Some of these scraps don’t appear in the blocks I made for her – the butterflies wouldn’t have been right for instance – but it’s predominantly blue and white so will serve as a reminder of the blocks I made for her. 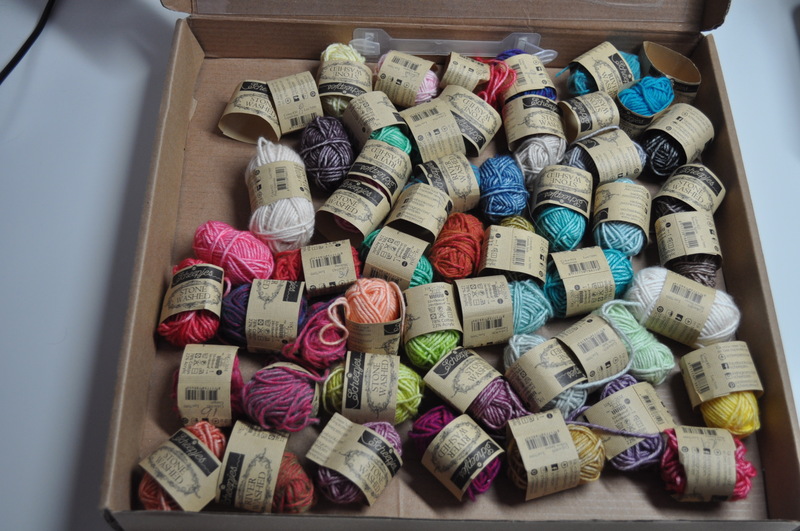 I have loads of yarn scraps left over from my Little River Blanket – remnants ranging from 3g to 5g – and I’m wondering what to make with those. Anybody got any experience using up such things? I’d be grateful for any ideas. As I’m making another of these blankets, I’ll have another 48 so the possibilities are endless – aren’t they? If you want to make use of your own scraps – can be anything, fabric, yarn, paper, whatever – just contact Kate or Gun who organise ScrapHappy Day on the 15th of every month and, if you have something, Kate will link to your blog, if not, nobody will mind. Here’s a link to Kate’s post this month where you will see a link to the other participants. A Quilting We Will Go……. Having received all my blocks from the F2F block swap back at the end of October and having signed up to do it all over again later this year, I really want to get this quilt finished before starting the next swap. I have made a start by laying out the blocks in rows as they will appear on the final quilt and then putting them into bundles of eight blocks not forgetting to label each bundle with the row number. Some of the participants are making a couple of smaller quilts with their 36 12.5 inch blocks but I have a Superking size bed so a huge quilt is needed in my case. Apart from the quilt we made for Pat which we rushed to get finished in order for her to see it before succumbing to ovarian cancer, Avis from Sew Tempting was the first to finish her quilt which is beautiful and has inspired me to get a move on. 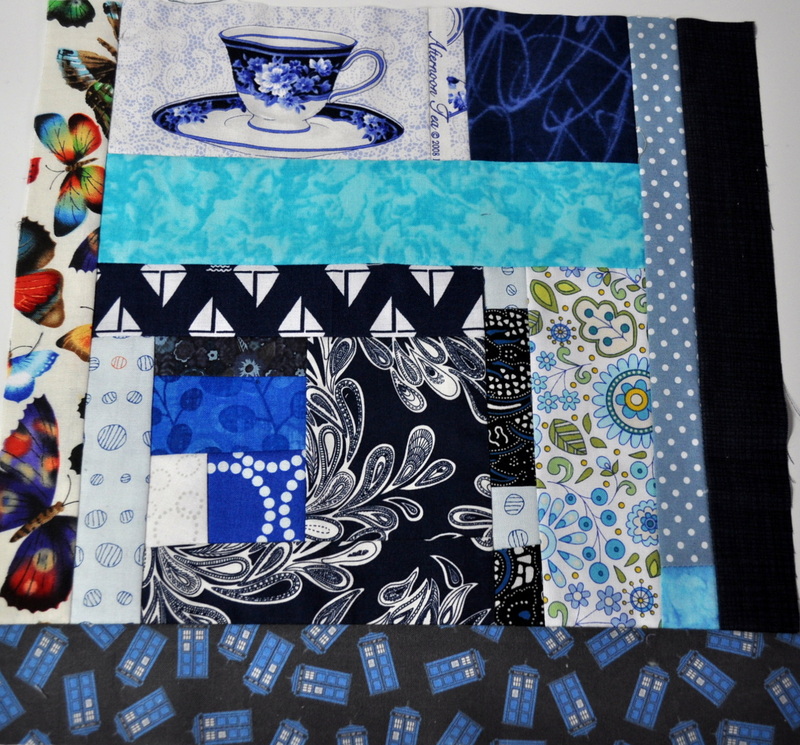 These are the four backing fabrics I’m using which I chose to coordinate with the top. 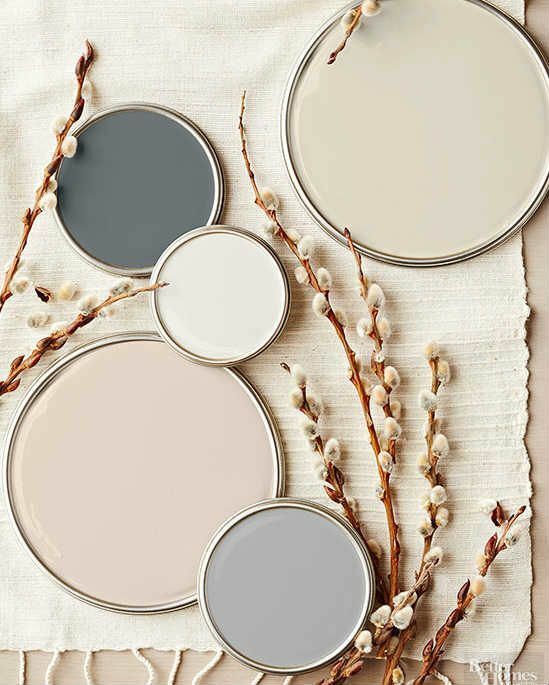 The four corners I’m not sure about yet but I’ll think of something. My hand quilting is not perfect by any means and I am very slow at it too and, with such a large quilt, I would be here forever if I attempted to do it all by hand. My machine is not particularly adapted for quilting and I couldn’t bear the thought of forcing the huge quilt sandwich through it so I am using the quilt as you go method. This way, I can make each block into a sandwich with the backing and a layer of wadding and quilt them individually. I am going to use this tutorial which has been recommended to me by several of my quilting friends in blogland. 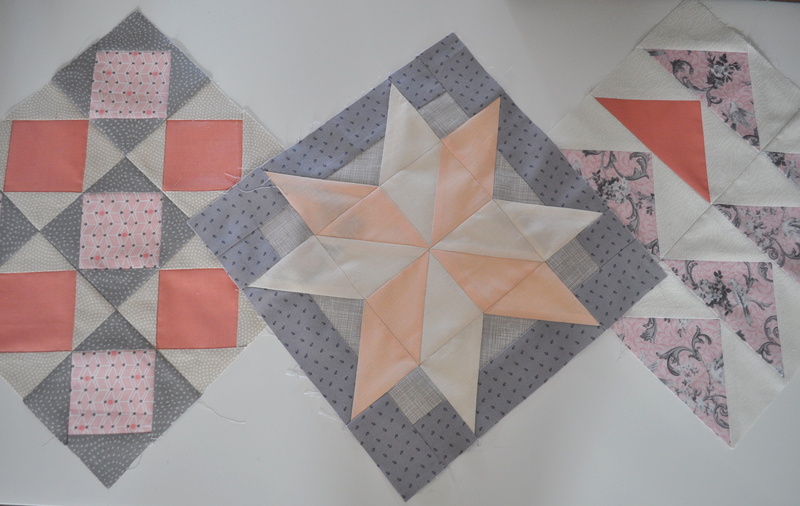 This also means I can quilt each block according to the design on the front. 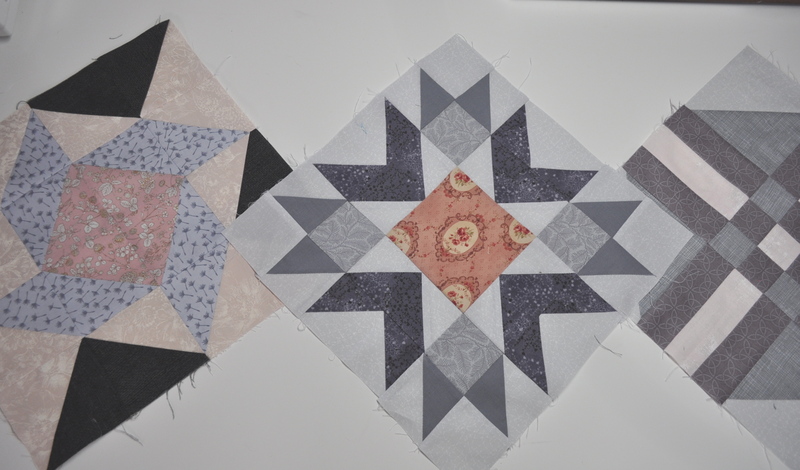 Much easier to handle – although I’m still not quilting them all (if any) by hand! and here’s one of the blocks I’ve made into a ‘sandwich’ so far – it’s one of the lovely blocks that Kate, who jointly organised the F2F swap, sent me. Apologies for the garish yellow background but the only decent light for photography that day was underneath the skylight in my workroom which is where my ironing board normally sits and that’s the cover! Since we made the quilt for Pat which will be auctioned in aid of an ovarian cancer charity in the U.S., Kate decided to contact the equivalent organisation in Melbourne and offer to make a quilt – using teal and cream or tan to raise funds for them. She asked her blog followers if anybody wanted to contribute a block or two so I made the one in the top photograph which I’m hoping she will be able to use in the centre of the quilt which she wants to resemble a large tablecloth laid out for tea. I didn’t have any teal fabrics at that stage but did have some teal coloured thread so used it for the appliqué stitching and for the ‘tea pouring’ effect. Then there will be a border of dresden plate blocks so I’m going to have a go at making one with the help of some pieces of teal fabric kindly sent to me by Ali over at Thimberlina who has also made a couple of blocks for the quilt. Then, there will be an outer border of more freestyle blocks made using the same colours. Kate is calling it ‘Time For Teal’ – she does love a pun. When we moved into our house there was a huge, hand made ladder hanging up in the shed. It was really too big and probably too dangerous to actually climb up so Mr. T recently treated it for woodworm, sanded it down, gave it a couple of coats of varnish and cut it in half. I’m using one of the halves for a quilt ladder. I am running out of room to drape, throw, fold and generally exhibit quilts around the house so it seemed like a good idea to store and display several of them at once. It doesn’t normally stand in front of a door but there wasn’t enough natural light to take a photo of it in its usual position. Luckily I am a very slow quilt maker but there is always the second half of the original ladder to fill. As you know if you are a regular reader, a diverse group of patchworkers and quilters have been participating in a year long block swap since July 2015 and one of our number started out the swap knowing she had advanced ovarian cancer. We pulled out all the stops to get her blocks done and then they were assembled and quilted for her as, by then, she was too weak to do so herself. She received the quilt last week – a month after we started it – and was able to see and touch it for just two days before she died. The quilt will eventually be auctioned online on behalf of Ovarian Cancer but we were all pleased that it reached her in time. I don’t think any of the group knew Pat personally but, as most bloggers will know, when you interact with people online you do come to feel as if you are acquainted in some way and the making and exchanging of blocks added to that feeling. and here’s the finished quilt in Pat’s chosen colours of teal and tan – the colour of the ovarian cancer ribbon – hastily photographed by Sue after piecing and quilting before being sent express delivery.